I received a copyright infringement complaint and my original publication was temporarily removed by Google/Blogger. I can only speculate that the complaint has come from Sila BG - they are the actual owner of the Haya Labs brand. I filed DMCA counter notification and I'd like to present you some more details. Just take a look at the above URL - it is clear that the brand Haya Labs has been registered by Sila BG OOD (the abbreviation OOD is the Bulgarian equivalent of the internationally recognized LTD). This fact by itself is enough to conclude that Haya Labs is not US brand but a Bulgarian brand registered in UK. Historical WHOIS records for the domain "hayalabs.co.uk"
The above screenshot shows the historical WHOIS records for the domain hayalabs.co.uk. 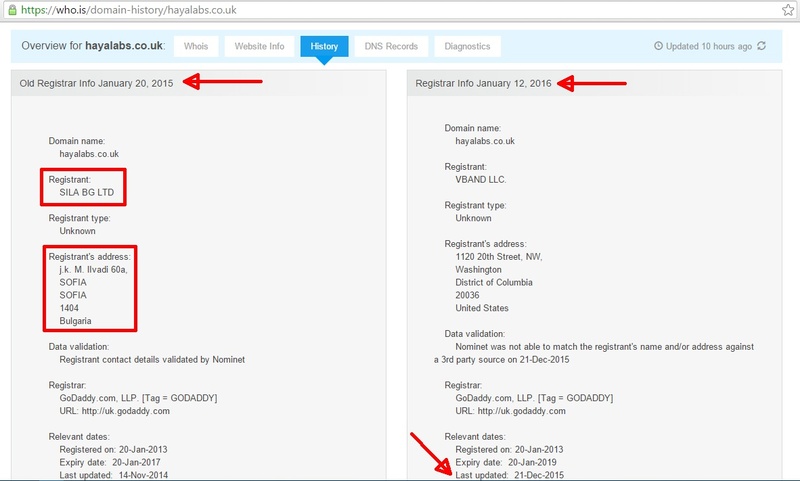 As you can see, one year ago the domain owner has been Sila BG LTD. Since 21-Dec-2015 the new owner is hidden/unknown. Once again, we have enough traces to conclude that "Haya Labs" operates from Bulgaria. DNS records for the domain "hayalabs.com"
Both hosts are part of the hosting provider superhosting.bg. It is unclear why the US brand Haya Labs decided to use Bulgarian hosting provider for its email services. I think there are enough email providers both in USA and UK. Well, considering the information from the previous screenshot, I believe Sila BG simply forgot to change this DNS record. Note that this is not historical data - this is the real DNS record data, which is publicly available at this moment. I will update this publication with more interesting information really soon, so stay tuned! Below you will find the original publication. Please be advised that all information was accurate at the time of the original publication, which was approximately 6 months ago. "HAYA LABS is set in 2011 and now is a leading manufacturer and worldwide distributor of high quality dietary supplements for health, wellness and sport. The company's headquarters are established in USA, and recently opened an office in London, United Kingdom for representation and distribution in Europe. The products complies with all regulations in nutrition industry in EU. Guarantees for best quality and purity of all ingredients are the huge number of company's awards and certifications, such as GMP, USDA Organic, Kosher, Halal, IFOS, NSF, NSF Sport and TGA." http://www.whois.com/whois/hayalabs.com - unknown owner, Bulgarian hosting provider (superhosting.bg). 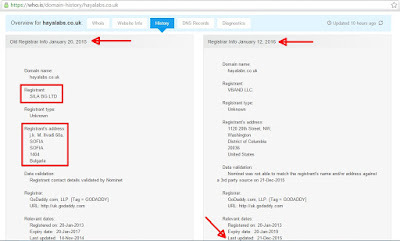 http://www.whois.com/whois/hayalabs.co.uk - the owner is SILA BG LTD, which is a Bulgarian based nutrition supplement retailer. The hosting provider is again superhosting.bg. http://www.whois.com/whois/nutraholic.com - unknown owner, the hosting provider is again superhosting.bg. http://www.whois.com/whois/bodytimero.com - unknown owner, the hosting provider is again superhosting.bg. http://www.whois.com/whois/nutrapump.com - unknown owner, the hosting provider is again superhosting.bg. http://www.scamadviser.com/check-website/hayalabs.co.uk - almost the same thing. The site is owned by SILA BG LTD (as we already know). A quick search in the Bulgarian commercial registry agency (brra.bg) reveals that Vasil Radivoev is one of the owners of SILA BG LTD. So, my personal conclusion is that Haya Labs is a Bulgarian brand and the actual supplements have unknown origin since there is absolutely no reliable information about the actual manufacturer. Besides, can we believe anything they say about their own products? They try to convince us that Haya Labs is an American brand when the facts clearly show that this is simply not true! Now it's time to say again that all of this doesn't necessarily mean that Haya Labs is a bad brand. It simply means that it's not a US brand. The products may still be manufactured in USA but I really doubt that. And I really doubt that we get the quality we pay for. I tried their product, called Yohimbine HCL. I took 20 mg (8 pills) on an empty stomach. Nothing. No stimulation. No aphrodisiac effect, nothing - zero effect. 15 mg should have had strong stimulant and aphrodisiac effect. Then I took 30 2.5 mg pills (75 mg, on an empty stomach). Still absolutely nothing. No stimulant effect - nothing. The recommended dose (on the bottle) is 2.5 mg 2 times a day. There is no yohimbine in their product, they are a scam and should be prosecuted. Great ..I've ended here just as you said...Thanks for this. I have received today Sports Creatine HCL and Sports AAKG from Haya Labs, ordered by an internetshop. They are both produced in St Petersburg. They were cheap. But now I will trow them away, don't trust the quality. Thanks for the info.